Kokoda is the product of six 2004 Australian Film, Television and Radio School graduates, and the fact that the film had a genesis of only two years(!) – from writing to distribution – is something to be respected in its own right. What’s even more impressive is the vision. Kokoda manages to be stunningly beautiful amidst all the mud, blood and grime, and Jules O’Loughlin’s cinematography is breathtaking. The majority of the film was recorded handheld, but the couple of times he was given a crane the movie takes on a majestic feel equal to any epic. The extended shot a few minutes in is a prime example, as we see the soldiers making their way up the steep mountain track, covered in mud. Kokoda is the ultimate tale of survival and loyalty against the odds. We follow the experiences of a small group of untrained soldiers who are awaiting reinforcements from the army proper (who have named them ‘chocolate’ soldiers, claiming they are inexperienced and will melt in the sun). The film features an impressive young cast (all male, of course) who immerse themselves completely in this harrowing piece of history, and are backed up by recognisable faces such as Shane Bourne and William McInnes (Look Both Ways). These two are brilliant in small yet crucial roles, but in no way impede the inspiring performances of the central players. There was a significant aspect of Kokoda that troubled me, however, and that is at times I had to remind myself that I wasn’t watching Wolf Creek. Once our boys are well and truly in the thick of it, Kokoda somehow becomes a horror film. I’m not talking about the horrors of war, but of the violent acts created with almost sadistic glee that you’d associate more with a no-holds barred horror film rather than a war movie. Such acts may be perfectly plausible, however the filmmakers capture them in a deliberate horror movie style. The enemy Japanese soldiers appear suddenly from the foliage and disappear just as quickly, leaving bodies in their wake much as any evil beastie would in a creature feature. It certainly pushes the boundaries of genre, which usually is to be applauded, but in this case one would think that the tale demands a certain amount of respect, considering the place it has in Australia’s history. Audiences going to an historically based war film aren’t expecting to cower in terror, awaiting the next brutal surprise, however implied the gore may be. This phenomenon didn’t bother me the slightest in Wolf Creek or The Texas Chain Saw Massacre… well, that is to say it did bother me, but not on moral grounds. Those films felt like acceptable forums for such displays. 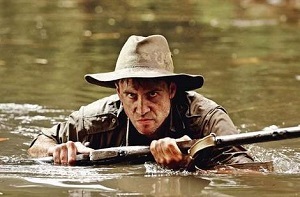 It remains to be seen whether audiences will be bothered in the same way I was, but Kokoda is undoubtedly starting off Australia’s 2006 list of films with a bang. An exceptional creation from first-time feature filmmakers, it is an impressive vision of the tale forever imprinted on the nation’s psyche. This entry was posted in Film Reviews and tagged Horror, Period Drama, War by Stuart Wilson. Bookmark the permalink.